I judged a book by its cover but I felt like reading some fluff and the cover caught my eye, appealing to some of my more crepuscular inclinations. I don’t read much horror. Come to think of it, the last horror novel I read was Robert Bloch’s Psycho a quarter century or so ago. So I’m not the best judge of the genre, but after a look at the reviews on Goodreads it almost seems like Andreas is a shoo-in for the PEN/Hemingway Award. Except that it’s a novella and not really a novel so it doesn’t technically qualify. (Not that that novel/novella caveat really matters…isn’t that right Ian.) The Goodreads rating system raises an issue that I think about a lot when it comes to just about any ratings aggregate drawn from the general public. Maybe the 17 people that gave Angel of the Underground an average GR rating of 4.24/5 tend to really enjoy mediocre books with first-person female leads written with all the insight that comes with being a 30-something white dude. Only slightly unrelated, I was trying to find a decent place to stay in Palm Springs and kept happening upon 2-star lodging with glowing reviews from people that I assume were used to dorm-style hosteling. “Like, no bedbugs dude! Five stars!” Reviews are only as good as the people doing the reviewing. Duh. Which is also why I’ve never given stars on Goodreads. I do sometimes say something/one is worth reading on here, though, but I figure the three of you that keep coming back here maybe share my reading preferences and proclivities. But who knows? All that to say this book was okay and served its purpose, which was to be a fluffy break from reading other stuff. And I read the whole thing, which I can’t say for some “important” books (I’m looking at you, Tolstoy). So there’s that. And so week sixteen was another week of Garmin fails, with two in a row first on Tuesday evening and then again on Wednesday afternoon. Then on Friday my new Garmin Forerunner 235 arrived and I took it out for a test run on Saturday and guess what? It was a a bit of a mess. I knew something was up when I neared home and then had to take a few detours to get the watch up to 21.1 KM on the 23 KM route. 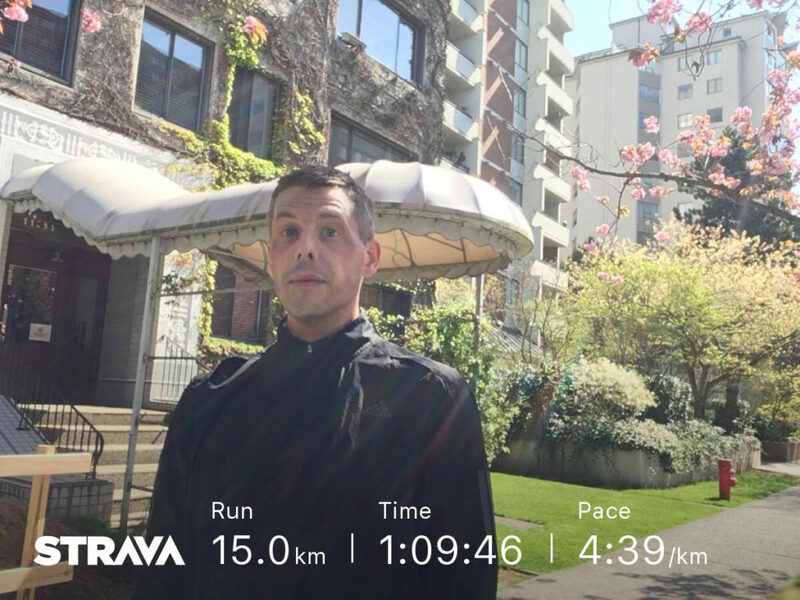 When I checked the data there’s a GPS glitch that shows me taking a couple kilometre detour from my run to take a swim in English Bay and I’m starting to take it personally. This with both GPS and GLONASS on. This morning, I tried again, resisting the temptation to run the Strava app on my iPhone in parallel. But I also switched the tracking from Smart to Seconds, and ended up with much better results, although not without some discrepancies. I tried a somewhat analogue calibration exercise, so take it as you will. As I entered Stanley Park at the 0 KM plaque I checked my watch and it read 4.69 KM, then I checked every 2 KM plaque until the 8 KM marker at Second Beach Pool. So by my purely anecdotal exercise my new 235’s GPS is off by between 10 and 20 metres per kilometre. And I can live with that, I guess. I’m not sure that I can hope for any better, but I’m sure glad I didn’t opt to splurge on the 735XT or a Fēnix 5. Anyway, I have a gently used Garmin Vivosmart HR+ for sale. Cheap.